Dog and cat wagging tail clocks are an adorable way to check the time! Each is hand-crafted of fine materials, and incorporates a moving tail pendulum for the animal that the clock portrays. Moving tail clocks make great gifts, and are sure to be the spotlight of attention in any home. 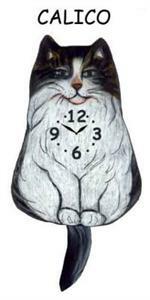 See our animal wagging tail clocks, either cat clock with wagging tail or wagging tail dog clocks.